Recently I’ve been researching the mythology behind Easter (see my April 3 post) and thus also that behind Christ’s resurrection. When reading the literature on the subject, one inevitably comes across claims that Christ was just another “dying and rising god” of the ancient Near East and Mediterranean. Further, the Christ Myth theory (which I have been following with interest for quite a while, although I am yet to be convinced) embraces this idea to argue against the historicity of Jesus. Since I have had this recent opportunity to update and refine my thinking on the notion of dying and rising gods, I decided to share that here. It is not feasible to cover the vast body of evidence in question in a blog post, so my main purpose here is to chart a framework for thinking about the subject, which I hope will be helpful to my readers. The sources that I reference in this post are listed at the end. The notion of a category of “dying and rising gods” is most famously traceable to James Frazer, who in The Golden Bough wrote at length about Adonis, Attis, Osiris, and Dionysus in particular as exemplars of this category. According to Frazer, the dying and rising god was closely connected with the seasonal cycle of vegetation, so that the god’s death marked the onset of the barren season and his resurrection marked the coming of the fertility of spring (or analogous season depending on the climate). Since this seasonal pattern is ubiquitous, Frazer thought, it is not surprising that this mythological motif was so common. Beginning with an article in 1933 by Roland de Vaux and through to the end of the 20th century and beyond, various scholars have attacked the notion of “dying and rising gods.” In my reading of this literature, the criticism has come mainly from two camps. One has been from regional specialists generally hostile to comparative approaches to religion and myth (e.g., de Vaux; Mark S. Smith in respect of Ugaritic studies and the god Baal), who were keen to point out how the gods in question from Mesopotamia, Canaan, and Egypt did not fit completely into the alleged category. The other has been from Christian apologists, who in principle oppose the idea of Christ being viewed as a “dying and rising god,” and so have been inclined to deny the category itself (e.g., Eddy & Boyd, pp. 142-46). This trend reached a high point in 1987 when Jonathan Z. Smith published his entry, “Dying and Rising Gods,” in The Encyclopedia of Religion, opposing the concept. Although in such a short (6-page) essay it was impossible for Smith to detail the evidence supporting his views, the piece resonated widely and found a welcoming audience well out of proportion to the essay’s value (not that it was badly written; it was just too short and conclusory to be of much consequence). Thereafter, the essay was frequently cited as if it were a definitive refutation of the notion of dying and rising gods, and commentators began to speak of a scholarly consensus disfavoring the idea. When I see this kind of thing happening, alarm bells go off in my mind: It is a sign that the pendulum may have swung too far based on too little, that groupthink may have taken hold, and that the truth may lie somewhere in the middle. Indeed, the Swedish biblical and ancient Near East scholar Tryggve Mettinger seems to have thought so too, and in 2001 published the most thorough study on the topic to date, The Riddle of Resurrection: “Dying and Rising Gods” in the Ancient Near East. Mettinger adopts a middle position, concluding after an exhaustive review of the evidence that, while it is not wise to hypostasize the gods in question into a “type” (p. 218), the fact remains that, despite the differences in each case, most of the gods under review did die in one manner or other (or were represented metaphorically as doing so) and were revived after the experience of death. Moreover, this motif was typically tied to seasonal cycles, and in most cases there was some accompanying associated ritual. To my thinking, this situation is analogous to the hero-cycle in myths, in respect of which mythologists point to a series of typical events in the hero’s birth and adventure (though mythologists – Joseph Campbell and others – differ somewhat over what the elements are). No single myth hits all the data points (itself a moving target), but it would be wrong to deny that there is a hero-cycle present among world myths. If one looks for an underlying reason for the similarities in dying and rising god myths and rituals, Frazier, though he oversimplified and overstated his case, does seem to have made a real contribution here in pointing to seasonal cycles, which surely have influenced people’s minds and their activities for eternity (Mettinger, p. 219). Beyond that, the similarities seem to arise from psychological factors. In discussing the psychology of the notion of rebirth, Carl Jung argued that the similarities in myths of dying and rising gods derive from archetypes of the collective unconscious and represent an effort of the psyche to experience a “permanence and continuity of life which outlasts all changes of form,” which helps develop the wholeness of the Self (CW 9.1, p. 117, describing in this case Osiris). Some ancient Near East scholars have acknowledged the explanatory value of a psychological approach to the symbolism (e.g., Frankfort, pp. 20-22). Osiris as generating the corn, as portrayed in a Bas-relief from the temple at Philae. Egyptians in fact made similar “Osiris beds” (also called “corn mummies”) in a funerary context by heaping earth in the shape of a mummy on a bier and planting seeds in it. 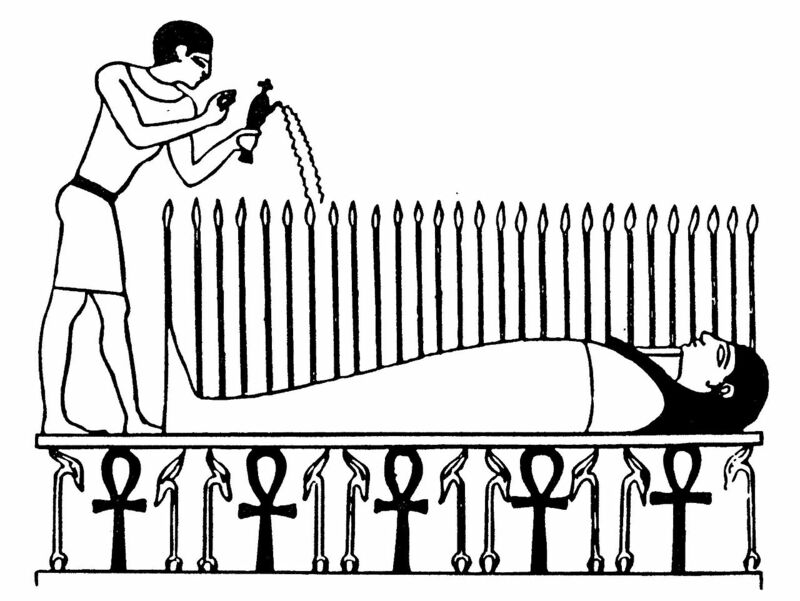 Once the seeds germinated, the bed/mummy was placed in the tomb, serving as a spell for resurrection. The bier here is supported by the ankh and was scepter symbols, which respectively symbolize life and welfare (among other things). Much of the case against dying and rising gods has been based on the argument that most evidence supporting the category is from Greco-Roman times and from within that culture complex (rather than the earlier Mesopotamian, Anatolian, and Egyptian cultures in which the gods arose). The opponents of the category recognize that in Greece, Rome, and Alexandria the deities had become conflated, and that in that late environment it was indeed possible to speak of dying and rising gods; their point, though, has been that the category did not exist earlier in these gods’ places of origin. Thus, for example, although there is little information about Attis from his original home in Asia Minor, once he and his consort Cybele had migrated to Rome, his death and rebirth were ritualized each spring during the Hilaria festival. Yet it is surely this later situation that is most relevant to whether the category can be applied to Christ, because that was the period and geography in which Christianity originated and grew. Nevertheless, commentators writing from a Christian perspective who deny the existence of dying and rising gods usually miss this point, conveniently focusing instead on the situation in earlier centuries and other geographies. When examining whether Christ was viewed as a dying and rising god, it is important to distinguish between (a) the origin of the notion of Christ’s resurrection in Judea and (b) the subsequent reception and expansion of Christianity in the Roman Mediterranean world. As to the latter, it is certainly possible that Gentiles were making this kind of comparison; we even see early Church fathers such as Origen and Jerome writing about these dying and rising gods. (Some scholars have even argued the reverse, i.e., that it was Christianity’s Christ story that inspired the contemporary reworkings of the dying and rising god myths.) An influence of the dying and rising god myths on the reception and growth of Christianity is thus entirely plausible, though it has proved difficult to pin this down. The accounts of Jesus’s life, teachings, death, and resurrection have nothing to do with vegetation or seasonal cycles, and everything to do with Second Temple apocalyptic Judaism. This resurrection was a one-time event, expected to be ushering in the end of the world. In God’s new kingdom, fertility and hunger would not be concerns. Christ’s death and resurrection was linked to his humanity (God having become human, or adopting this human as his son), whereas none of the dying and rising gods had this human factor, at least in the later era when Christianity arose. In the Christian understanding, the meaning of Christ’s death and resurrection was tied to his vicarious suffering for the sins of the world, rewarding the virtuous, and ushering in the kingdom of God. No such moral concerns are evident in the dying and rising god myths. Myths are normally reflected in rituals, and Christianity has a lot of rituals. The early Christian rituals did not resemble the rituals connected with rising-and-dying god myths (which reflected seasonal cycles and vegetation), nor do they have any logical conceptual connection with such myths. Finally, it is worth noting that even if the Christ resurrection story as it developed were to be found to conform to a dying and rising god motif, this would be technically irrelevant to the question whether Christ actually existed. A historical figure could be mythologized in such a way, and indeed many historical figures have been mythologized. The question of Christ’s historicity, however, is one of history that must be analyzed by historians using proper historical methods. Eddy, Paul Rhodes, and Boyd, Gregory A. The Jesus Legend: A Case for the Historical Reliability of the Synoptic Jesus Tradition. Grand Rapids, Michigan: Baker Academic, 2007. Frankfort, Henri. The Problem of Similarity in Ancient Near Eastern Religions. Oxford: Clarendon Press, 1951. Jung, Carl. The Archetypes and the Collective Unconscious. Collected Works (“CW”), vol. 9.1. Mettinger, Tryggve. The Riddle of Resurrection: “Dying and Rising Gods” in the Ancient Near East. Stockholm: Almqvist & Wiksell, 2001. Smith, Jonathan Z. “Dying and Rising Gods,” in The Encyclopedia of Religion 4:521-27 (1987). Smith, Mark S. “The Death of ‘Dying and Rising Gods’ in the Biblical World: An Update, with Special Reference to Baal in the Baal Cycle,” Scandinavian Journal of the Old Testament 12: 257-313 (1998). This entry was posted in Mythology and tagged Adonis, Attis, Baal, Christ myth, Dumuzzi, dying and rising gods, James Frazer, mythology, Osiris, Resurrection of Christ, Tammuz, Tryggve Mettinger. Bookmark the permalink. 4 Responses to Are “Dying and Rising Gods” Dead? I appreciate reading this article, getting different sources of information even contrary to my research. There is just one thing which I have read that I would like to say as not the case. If the disciples would be primed to have vision of the Christ, since you say that they are expecting of him. There are some accounts that the disciples where skeptical and does not even understand to what Jesus foretells of his Resurrection. Thinking that they might not even expect that they would have visions of Him, even the Disciple Thomas did not believe that Jesus rose from the dead (John 20: 24-25). Saul of Tartarus which later became Paul. Paul before was persecuting Christians. James, the brother of Jesus was skeptical about Jesus. Two of them are not even primed to see Jesus resurrection, they did not even believe. Also, Jesus appeared to 500 (I don’t think specifically the number.) Not even some of the disciples know that Jesus will rise from the dead. I know that Jesus foretells his death only to the 12 disciples. So in summary, hallucinations only happen to individual events, not shared by two different individuals, hallucination does not work that way. By the way, I really liked reading your article, even though I am a Christian, I read and get information from people or articles that are anti-Christian or contrary to our beliefs or faith. For I thrive for learning and wisdom. Yours approach is philosophical and I like how you are neutral. But when it comes to this kind of articles, read or info that makes Christianity as to be wrong or false, I am rational in the manner. Jesus- a dying/rising sun god. He rose like the sun. See solar hero myth. He was supposedly 33 as this is to do with the 33 year repeat cycle of the sun. He is depicted with a sun disc about his head in old paintings. We are told in bible that his face ‘shone like the sun’.